(May 8, 2016) The Charlotte Regional Transportation Planning Organization (CRTPO) has opened a 26-day public comment period that ends on June 1 to obtain public input on its draft list of projects that are proposed to receive local input points as part of the North Carolina Department of Transportation's (NCDOT’s) Prioritization 4.0 (P4.0) process. Prioritization is NCDOT’s decision making tool for developing the next Transportation Improvement Program (TIP), which is a listing of projects to be funded and delivered within an upcoming five-year work period. 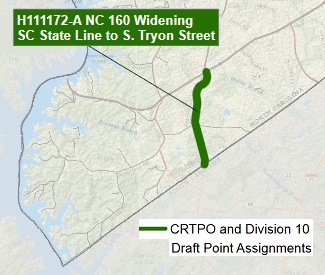 CRTPO is proposing to assign local input points to the widening of Highway 160 from South Tryon Street south to the South Carolina state line. This project is listed 10th on the draft list of projects on the Regional Impact Tier. Click HERE to see the full list. Click HERE or on the map below to see a map showing Regional Impact projects. In addition, Division 10 of NCDOT also plans to assign local input points to supplement the P4.0 scores for this Highway 160 project. The local input points will help ensure that this widening project will receive strong consideration for inclusion on the next State TIP to be approved in fall 2017. Your comments will encourage CRTPO to continue to maintain the Highway 160 project among the priority projects. Please send your comments of support BY JUNE 1 to Neil Burke of the CRTPO staff at info@crtpo.org; or by mail to CRTPO, Charlotte-Mecklenburg Government Center, 600 E. Fourth St., 8th floor, Charlotte, NC 28202; or by fax to 704-336-5123. You may also submit your comments at a public meeting at the Government Center beginning at 4:30 on May 18 or speak at the regular CRTPO Board meeting at 6:00 that evening. See the press release below for details. Two other Highway 160 projects will receive funding in the current TIP. Construction is expected to begin in 2017 on improvements to the intersection of Hamilton Road and Highway 160, and the right-of-way acquisition for the widening of Highway 160 from Shopton Road West to South Tryon Street is now scheduled to begin in 2020 with construction beginning in 2022. 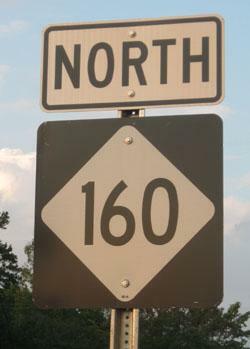 Construction is now underway in South Carolina to widen Highway 160 from the state line south to Gold Hill Road. CHARLOTTE, N.C. (May 6, 2016) – The Charlotte Regional Transportation Planning Organization (CRTPO) is requesting public input on the next stage of developing future Regional Impact transportation projects for Iredell, Mecklenburg and Union Counties. This process is administered by NCDOT and is called “Prioritization 4.0.” CRTPO is the federally-designated Metropolitan Planning Organization (MPO) for the Charlotte urbanized area. Highway, rail and transit projects are all represented on the draft lists proposed for Regional Impact local input point assignment on the CRTPO website (www.crtpo.org) at the link labeled “Prioritization 4.0.” Regional Impact highway projects consist of U.S. and North Carolina routes (i.e. US 21, US 74, NC 73 and NC 160), regional transit and rail projects. Beginning in September 2016, CRTPO will open a separate public involvement period for the Division Needs projects, which include road projects on the secondary road system as well as bicycle and pedestrian, rail, transit and aviation projects. The North Carolina Department of Transportation (NCDOT) has scored projects submitted by MPOs, RPOs and NCDOT Divisions according to formulas established under the Strategic Transportation Investments (STI) law. CRTPO has 2,500 local input points to allocate to its projects within the Regional Impact tier and an additional 2,500 points to allocate within the Division Needs tier of STI. The STI legislation specifies that MPOs, RPOs and NCDOT Division offices must adhere to their adopted methodologies to the extent possible when assigning local input points. Members of the public can also comment on the proposed project lists in person during a public meeting held in Room 270/271 of the Charlotte-Mecklenburg Government Center from 4:30 to 6:00 p.m. on Wed. May 18 and/or during the CRTPO Board meeting on Wed. May 18. The CRTPO Board meeting will be held in Room 267 of the Charlotte-Mecklenburg Government Center beginning at 6 p.m. Those who wish to speak must sign up at least five minutes prior to the start of the meeting. The Strategic Transportation Investments law has created a quantitative, data-driven approach to develop the Statewide Transportation Improvement Program (STIP) and its local counterpart, the locally-adopted Metropolitan TIP. As a result, the most important opportunities for public involvement in Prioritization 4.0 are when CRTPO selects projects for consideration, (which occurred in Sept. 2015) and when CRTPO provides input on the final priority of projects, which occurs when the MPO votes on the Regional Impact project list during the June 15, 2016 meeting and the Division Needs project list during the Oct. 19, 2016 meeting. The final product of Prioritization 4.0, the Transportation Improvement Program for FY18-FY27, will be adopted by CRTPO in 2017. More information is available on the CRTPO website at www.crtpo.org.